Prefer holes when selecting targets for aligned prints. Fixed binding conflict with arrow keys when console is visible. Deleting a file will force circuit processing again. Fixed bug where loading recent files could load incorrect files. Improved Gerber processing - better support for thermals and self intersecting lines. I'm doing some initial testing of v0.6.5 tonight, and it was going very well up until a few seconds ago. The "Aligned Print" feature is working great - it's a new menu item that loads in a bottom copper layer and it will auto-flip your drill file to line up the holes from your top layer. It also works great with Kicad! Quick note: I'm on OSX at the moment, does anyone else notice that the "Choose File..." selection dialog always resets to the root directory? That's kind of annoying - my PCB files are all close to each other and it's faster to go up-and-over a directory than it is to navigate all the way back down each time. There is a nice new step in the pad alignment phase that lets you manually probe/measure each drill and via - just click on any pad and the probe will move to that pad and probe all the way down into the hole. Makes me nervous each time. My problem arose in the next step where the V1 auto-probes the entire board after manual alignment - the probe got caught on a hole again and went into E-stop. At least this time it didn't keep attempting to probe other holes on and off the board! There is a problem here though. I'm now trying to realign the first 2 pads, and when the probe first moves to their rough location it moves to exactly the right spot (I'm guessing because it remembers calibration from last time). That's great, but when the "Lower" button is clicked to get the fine-grain alignment, the probe descends into the via and sits there - maybe because it bottomed out on the hot plate. I can't do fine-grain alignment from inside the via though. I'm going to try and intentionally offset the rough-grain alignment at first and see if that will let me center the probe nicely at fine-grain as it hovers over the board instead of having the probe go into the via. Update: Ok so the intentional misalign-at-rough-grain-realign-at-fine-grain dance worked well, but the V1 got caught on a via again. The same one, in fact! Even got a quick blurry video of the event. I took some extra time during the free-probe stage (where you can click a pad and probe it). The probe went into some of the holes as expected, but for many of them it just hit the edge and raised without entering the hole. This indicates human error, either in the drilling stage or the alignment stage - and since I hand-drilled these (on a beastly, accurate mill) I suspect that's where the problem is. This drill bit is a 66Y, which I think I measured to be 0.8mm. The vias are a 2mm pad with a 1mm drill (fresh code over here). I'm not sure how much more accurate I can be by hand (and machine) with these holes. Is it time to find a CNC mill? Thanks for making this post - I've pinned it for 2 weeks so others can see the changes. Quick note: I'm on OSX at the moment, does anyone else notice that the "Choose File..." selection dialog always resets to the root directory? This sounds like a bug. I'm making a note of it. If you are locating a large hole/via - that's is probably the way to go. Intentionally miss, and then fine tune it when the probe is hovering just above the board. If you are locating a small hole/via - The hole edges will probably trigger the probe as it descends, but the first option is probably safer. I just took a look at your video - Thank you so much for posting it. I certainly flinched when the probe got stuck. Fortunately, the probes can actually take quite a beating before causing permanent damage. The Batch 1 Kickstarter units had a different probe design that was susceptible to damage if you happened to look at it funny. We redesigned the probe in between batches to be much more robust and accurate. 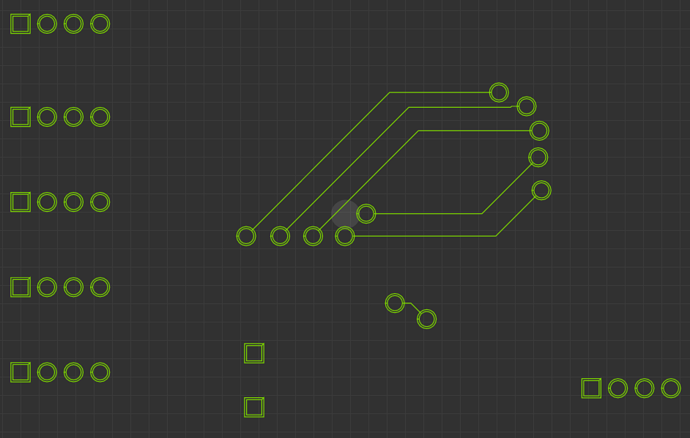 We have changed the code so that single pass traces are truncated at pads so that they don't extend into the hole. Below is a snippet of what it will look like. This should fix the problem. Obviously if the drills are very far off you are going to have a bad time probing, but I think in this case the holes were fine and it was actually a software bug. Wow, what a bug hunt! Really glad you were able to find that - I've been a tad worried. 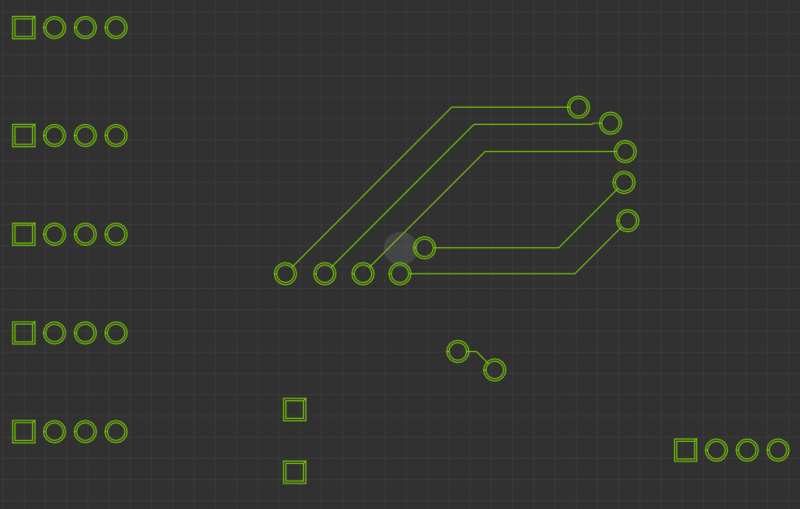 I'll do some testing with Kicad over the next few days, as this may have been a user-generated problem: Kicad draws traces into the center of all pads, and I manually resized the footprint and drill marks so that my smallest bit would fit. Perhaps if the pads were smaller this wouldn't be an issue, but there might be a way to tell Kicad to not route into the pads.